Trent Dilfer has done a lot in the world of football. He was a WAC Offensive Player of the Year at Fresno State. He put together a 14-season NFL career that included a Super Bowl victory with the Baltimore Ravens. His broadcasting career started with the NFL Network before he spent nine years with ESPN as an analyst and broadcaster before leaving the network during the cost-cutting purge of 2017. Even so, he’s still managed to remain a part of the football conversation, even if it’s not always for the best reasons. About the only thing, Dilfer hadn’t done in the world of football was be a coach. 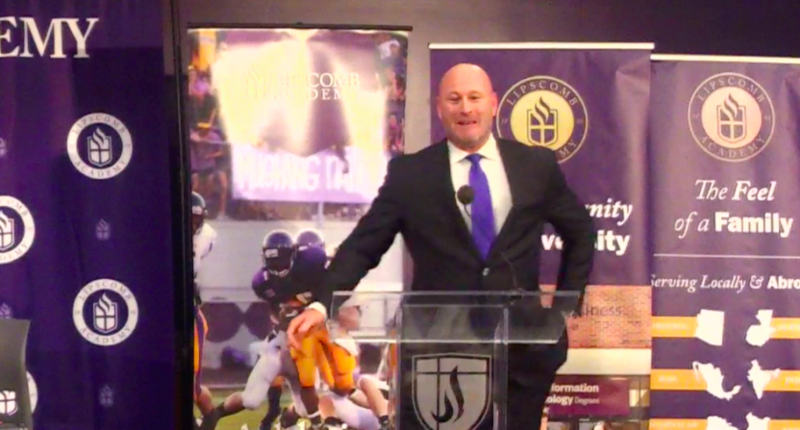 That will change now as he’s been named the head coach of the Lipscomb Academy Mustangs, a Christian prep school in Nashville, Tennessee. Lipscomb Academy is located on the campus of Lipscomb University, where his daughter will be matriculating on a volleyball scholarship. The program could definitely use a jolt. They’ve gone 35-32 over the past six seasons and 3-19 in the past two seasons. As for whether or not Dilfer can field a successful squad as a coach, that remains to be seen. But it’s certainly a PR-generating hire for the academy. He’ll be chasing the ghost of Glenn McCadams, who put together a Hall of Fame career at Lipscomb with a 319-112 record and three state championships. McCadams passed away in 2013. God’s still gonna need to see some improvement on the scoreboard, though.